Announcing! 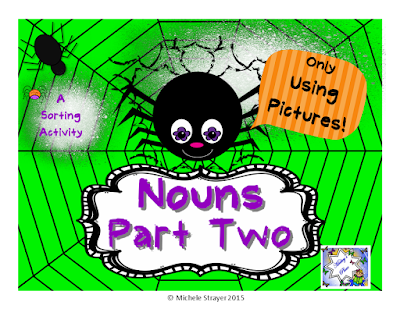 Amazing, Nouns, and Verbs, and Adjectives, Oh, My! When our primary students come to school, they are so excited learning how to read! Then, we throw out to them, you have to learn GRAMMAR! "Nouns, Verbs, Adjectives" you say. "So simple!" Verbs show action, so you take a ball and have the students, catch, bounce, roll, throw, and other actions. That is pretty easy. Having the students act out their actions, reinforces what a VERB is. Nouns are just people, places, and things. Students think that is easy, but then they start to identify nouns. Places are where you go, but then a place can be a tree, but a tree can also be a thing. OH! MY! Eventually, little ones will understand the concept of people and places. Alas, THINGS can be unlimited. You can't tell students that a thing is non-living, because animals are things. So what is a good way to identify things? Put them into categories, such as food, animals, clothes, furniture, monsters, books, etc. Then ask the students if the item can complete an action. If not, it is not a verb. Is it a person or place? Again, if they say, "No!" then they have an easy solution, it is a thing. Then you have to teach them about ADJECTIVES. Usually we tell students that adjectives are words that describe a noun. Luckily, they do recognize opposites, such as, big and little, thin and fat . This helps them in their understanding of what is an adjective. Remember, that learning English and its grammar usage is hard. Concentrate on letting them learn to read. Gradually, in conversation, or while reading a book, point out the simple nouns, verbs, and adjectives. Simple: sort pictures into categories, use real objects when you can, and use simple sentences. Keep in mind, it is like learning how to walk. They had to toddle along first, then they got it. Go slow, let them think about the words, and give lots of praise when they get it. If they mess up, just explain why, and go from there. Here are links to two free Write the Room grammar sorts, one for Fall and one for Halloween for older students. Enjoy!